"Havenhurst" wastes no time getting started. It has an opening scene that will send chills up your spine and it will make you coward in your seat. After the opening scene things quiet down as we meet Jackie, a young woman with addiction problems that has just been released from a rehab center. We see her on the phone asking about her friend whom she has not heard from in weeks. After getting released her counselor sets her up to live in an old apartment building known as Havenhurst. Havenhurst is run by an old lady who uses the place to house people with addiction problems while they are on their recovery. But if you don't follow the rules you get evicted. Once Jackie arrives, she notices she is given the same apartment her friend had and her friend’s camera is still in the apartment which is odd because she never went anywhere without it. If that isn't bad enough strange things begin happening and she hears screams right before people start disappearing. When she questions it, she is told they were evicted for not following the rules. Now she must find out what really happened to her friend while trying to stay alive herself. Like I already stated, the film has one hell of an opening which suggests it’s another in a long line of supernatural thrillers but I was pleased to find out that it was a lot different horror film. The story is well-written and the main character is well-developed and well written too. We get to find out how she got to where she is through flashbacks. The old building is the perfect setting for the film, its dark, gloomy and it creates the perfect mood. It also has its secrets and as it moves along we find out that its walls, floors and even beds move. There is also a good bit of mystery in the film but a little past halfway through we find out what is really going on and where those that went missing really went in gruesome fashion. There is also a major twist or revelation late in the film that ties the story together. 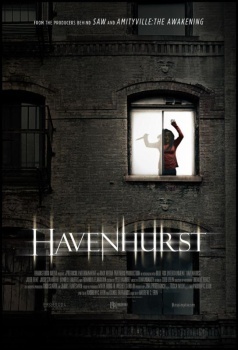 "Havenhurst" is a very entertaining horror film with plenty of tension, suspense and scares. Another thing that made the film so good was the cast. The always amazing Danielle Harris makes a cameo in the film's opening scene as Jackie's friend who goes missing. Julie Benz is terrific as Jackie and Fionnula Flanagan is amazing as the evil landlord. Belle Shouse is also fantastic as a young girl who lives in the building with her foster parents. The rest of the supporting cast was all excellent as well. Director, Andrew C. Erin does a great job keeping the film moving at a nice pace and creating a lot of chills and thrills. If I had one complaint about the film it might be how it ends but I was happy that it at least didn't have a typical Hollywood ending. I recommend this film to all fans of horror, be sure to check it out when it opens on February 10th with a limited theatrical and nationwide Cable VOD and Digital HD release.